“Virgin area — exciting,” John Mack wrote in a 1964 note to himself. He was referring to an opportunity to develop new ways of delivering mental-health services at a Massachusetts hospital. But that spirit of enthusiasm and risk-taking is a neat summation of the Harvard psychiatrist’s long and controversial career as a scientist and activist. Mack has never shied from exploring frontiers. While most of his colleagues toiled away quietly in Harvard’s ivory tower, Mack protested nuclear tests in Nevada, flew to war-torn Lebanon to try his hand at Middle East diplomacy and drank toasts with Soviet colleagues in cold war Moscow. And most famously, he listened to people who told him tales of alien visitations and abductions-and believed them. His behavior, unusual for an Ivy League academic, has made the lanky 71-year-old a figure of fun for the mainstream, a well-meaning modern-day Don Quixote to those with progressive leanings and a knight on a white horse to those who believe aliens are among us. Yet even those friends and colleagues dismissive of Mack’s abduction theories acknowledge his deep-seated commitment to tackling problems at all levels — personal, social and spiritual. “His really important insight is that people can change, that they can crack open,” says one academic friend. Another friend says that at Mack’s core is a passion to understand and ease human suffering. Ironically, Mack’s unusual journey into the alien realm has reaped him his own share of suffering, from damage to his professional credibility to loss of old friends and the breakup of a long marriage. Mack himself seems at a loss to explain why he is who he is, given a background lacking in either social activism or spiritual matters. A self-described introspective child, he was born into a family of prosperous German Jewish academics in New York. His father read the Bible, but only as literature in that atheistic household. But suffering was not an abstract concept in his early life. Mack’s biological mother died of a ruptured appendix when he was only eight months old. His mother’s sister later married a Holocaust survivor, a man who became an expert in group process and psychotherapy. Another uncle was mentally ill and eventually lobotomized. “That was a big factor in my choosing to go into psychiatry,” he says. The dark-brick insane asylums that he and his family passed during trips to the country haunted him. By age 12, he was hunting out psychology books in his school library. After finishing medical school and marrying Sally Stahl in 1959, they left for Mack’s two-year stint in Japan as an Air Force psychiatrist, where the first of their three sons was born. The culture shock was intense. Life there, he recalled later, taught him how “fantastically ethnocentric and ecologically destructive we Americans can be.” The family returned to the United States, and Mack plunged into Harvard psychiatry in the 1960s, when ideas about mental health were being overhauled. He played a key role in creating a novel psychiatric clinic for both in- and outpatients at a derelict Cambridge city hospital that Harvard University had taken over. But ever the intellectual peripatetic, Mack’s fascination with T. E. Lawrence led him to write an in-depth biography of the enigmatic man who played a key role in Middle East politics, and in 1977 the effort earned him the Pulitzer Prize. Lawrence lived out a creative vision of changing the world that intrigued — one of his friends says obsessed — Mack. By the early ’80s, when he had entered what for most tenured professors would be comfortable middle age, Mack, at the urging of his children, was drawn into two more virgin territories — the realm of spiritual questing and the world of political activism. He experimented with holotropic breathwork, est and psychedelic drugs. And he was drawn into Middle East politics, meeting solo with Yassir Arafat in Beirut to discuss prospects for peace. Next he threw himself into the growing antinuclear effort during the Reagan years, exploring the psychosocial aspects of the nuclear-war threat and testifying before Congress on such issues as children’s nightmares of an atomic holocaust. Eventually he turned to a more active role; his entire family was arrested in 1986 at the government’s Nevada Test Site for protesting underground nuclear detonations. His breathwork in particular set the stage for his interest in aliens. “I was open to the possibility that there was a world beyond that which could be seen,” he recalls. 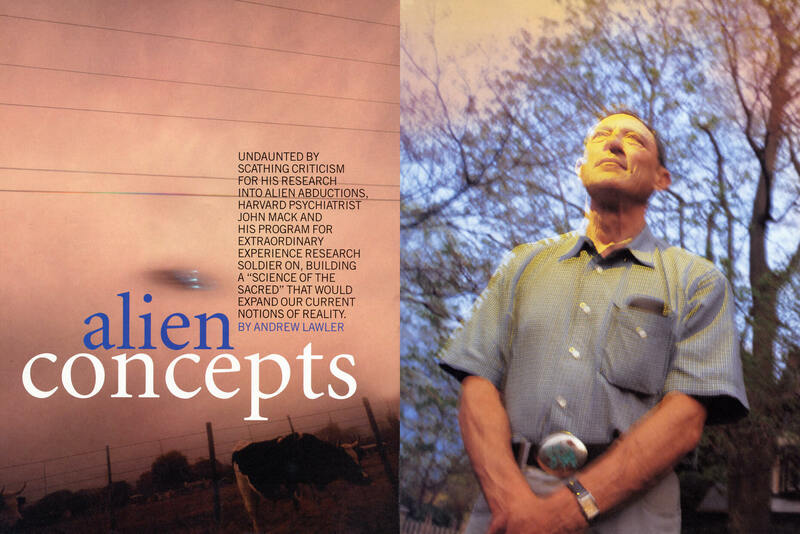 Mack began seeing patients who described a variety of alien encounters, and then he created the Program for Extraordinary Experience Research (PEER) within Harvard’s Center for Psychology & Social Change. (Currently neither the center nor PEER is affiliated with Harvard.) His 1994 book on the subject (Abduction), which focuses on interviews that detail the experiences of a handful of the 70 people who said they were abducted, provoked ridicule and outrage in the mainstream media and a Harvard investigation into his scientific methods. Undaunted, Mack has soldiered on, gathering more data and interviewing people from all over the world, publishing Passport to the Cosmos: Human Transformation and Alien Encounters in 1999, which focused on alien-related myths and experiences in native cultures, from the Amazon to southern Africa. In person, Mack has the cautious traits of a scholar, the wariness of a maligned media figure and the innocent enthusiasm of a young college student discovering himself. During a lengthy interview at PEER headquarters — a nondescript Cambridge walkup that resembles a postdoc’s apartment — Mack talked with New Age about his latest frontier. What follows is a much-shortened and edited transcript. Q. What was your first encounter with the alien phenomenon? A. I read an article that treated the phenomenon as a spiritual emergency, and a colleague in my breathwork training program took me to see Budd Hopkins [author of several alien-related books] in January 1990. At first I didn’t believe it was possible to encounter beings from beyond the Earth, but it became apparent that I didn’t have any other way to explain what was happening: If different people who are not connected have the same detailed experience, then you are not dealing with an internally generated effect. So I got curious. Q. How do you test the reliability of these claims? A. I do a careful psychological evaluation of their mental states, take their psychological history — the standard clinical exam and, in some early cases, batteries of psychological testing. I will get character witnesses to assess whether they embellish the truth. And there is something more, which I’m still struggling with. It is feeling that a person is speaking as if they’ve been there — this comes from body language, the look in their eye, from having no other agenda. I’m working to better define this. Q. So do you see what you are doing as science? A. I have to be open to the fact that there are realms or dimensions of reality that I don’t know about. Knowing is not the same when you can’t create a controlled experiment, but there still can be reliable ways of knowing. I can’t create an experiment that brings a bunch of UFOs together. But I do believe there is a quality of openness of mind and rigor we can apply. We can develop standards of authenticity, reliability, multiplicity of witnesses. This might be considered a science of the sacred or of human experience. Q. What kinds of standards do you envision for such a science? A. We have an anomalous-experiences project at PEER, which came out of a 1999 workshop on the topic that included theologists, anthropologists, astrophysicists and philosophers. We are looking not just at the abduction phenomenon, but near-death experiences and other such phenomena that don’t fall into a single discipline. And we want to explore traditions where there are, if not standards, witnessing and truth-telling traditions — that is, methods of how you decide who to take seriously. The Buddhist and Catholic traditions deal with this in detail, for example in determining what is a miracle and what is not. Father Corrado Balducci, a retired gentleman close to the Vatican, once shocked me by saying that the Church takes very seriously these reports of UFOs and abduction encounters because there seem to be so many reliable witnesses. The Church has a tradition of determining who is a reliable witness. I began to think about this notion of the sacred witness, or the witness of the sacred. We don’t want to take on, for example, Catholic or Buddhist standards wholesale, but they can be guides. Q. So these standards could be applied to all sorts of anomalous experiences? A. The new age world is filled with people working on everything from alien experiences to channeling, but there are no real criteria to tell you what to take seriously. There’s been appropriate criticism of a lot of new age work. Just because someone says he or she channels something doesn’t make it truthful. The scientific method has ways of deciding on the reliability of physical evidence. But if there is no physical evidence — no physical marks on the body, for example — there has to be a way to take data and determine its validity. Q. Are you trying too hard to drag science into an area that is the domain of religion? A. Barbara McClintock, a Nobel Prize winner in genetics, described her way of knowing as highly subjective. She would fall in love with ears of corn; she fused with what she was working with. Of course, after you’ve learned in that interconnected subjective way, then you use your rational mind to add it up and make sense of it. But your instrument of knowing is your whole self, your intuitive self, your full consciousness. What really good scientists and those who take us “beyond the veil” have in common is full engagement with that other self, with the matter at hand. Q. You say breathwork opened you up to other worldviews. How did this unfold? A. I realized I was not stuck in my academic, psychoanalytic tower — I expanded out of my shell. I had this sense of connection with all these people that was unexplainable to me. This sense that each of us were in some way open and loving people — and the same, that we were one in a way, and under natural conditions that we can connect in a way that is quite different from the usual competitive isolation in which we live. Q. How does this relate to aliens? A. We are spiritual beings connected with other life forms and the cosmos in a profound way, and the cosmos itself contains a numinous intelligence. It’s not just dead matter and energy. Q. Are your ideas about abduction more accepted now by the mainstream than in 1994? A. No, on the contrary. There are those who fear what they see as a danger of the return of the irrational. But on the fringes there is also a growing excitement and interest in understanding reality not known by the traditional scientific method. So there is a kind of heating up, not of a paradigm war, but a not-very-friendly discourse between contending worldviews. Q. Alien “experiencers” are considered crazy by the mainstream. Do you see them as an oppressed minority? A. The ridicule of these individuals and the dismissal of their stories has profound moral implications. A society cannot long survive if its truth tellers are rejected. I believe these witnesses are truthful, regardless of the fact that what they are talking about can’t be true from the dominant materialist worldview. And their dismissal does make them a kind of suppressed minority. I began to see that the outright dismissal of the testimony of reliable witnesses was because what they reported wasn’t consistent with the dominant worldview. Q. How do you react to the weird varieties of aliens abductees describe? A. The whole business of the demographics of alien beings is quite humorous in a way — blond ones, reptilian ones, insect like ones, praying mantis-like ones and of course the grays. The whole thing in a way is comical. And then you get into what star system are they from. It’s almost like a cosmic joke. . . . When a culture become sterile and complacent and locked into a limited worldview, the trickster shows up and shakes up the whole system. Q. So do you personally believe in this phenomenon? A. It’s a no-brainer. It can’t be accounted for in purely interpsychic ways. Many people are having these experiences around the world, spontaneously. It has to come from somewhere, what William James called a “provocation from without.” I see it in the context of the global ecological crisis. The Earth is a source of creation and life, and out of ignorance, greed and aggression, we are destroying it. I see an awakening of consciousness about this, a spiritual reconnection with the sacred, with the divine. Q. Has the personal and professional toll taken by delving into abductions been too high? A. I don’t have regrets. Although there have been critics and attacks, I’ve met so many incredible people who are open to new knowledge. I’ve probably gained more colleagues and friends since I began this than I had in the period before — they are just different. I don’t resonate in the same way with a number of other people. Life is short, and one tends to gravitate to people one is in tune with. It’s been more of an expansion of my horizons and an opening to exciting connections and possibilities than it has been a suffering. What’s enabled me to feel on the whole pretty good is that people are starting to research other anomalies of other kinds. And there have been a lot of pioneers before me. Q. Do you want to have an abduction experience? A. I don’t think so. One reason is it is often scary, but I think I could handle that. Second, my reliability and role as a witness of the witnesses depends on my being clean on that score. I’ve seen examples in which investigators who had experiences or acknowledged their experiences really lost credibility as investigators. I feel myself to have a different role. I don’t even let myself think of that too much.